Sophie Esah, of the Micronesian community, offered a lei yesterday in reconciliation to Pau Galu, high chief of the family of Fusitogamala "Fusi" Savea, who was killed Dec. 26. Micronesian community leaders gathered yesterday at the funeral of a slain Samoan man to ask forgiveness from his family and friends. The accused slayer, R.J. Ham of Chuuk, Federated States of Micronesia, was arrested on Jan. 2 after a family member's tip led police to his location. "Life is so precious and ... words cannot express how much we feel about what had happened," Sekap Esah, pastor of Nuuanu Baptist Church, told the group assembled for the victim. "We're with you. We're very sorry." On Dec. 26, just after midnight, Fusitogamala "Fusi" Savea, 18, was standing in the parking lot of Sunny's Market at 2215 N. School St. when Ham, whom he did not know, allegedly stabbed him in the chest with a knife. Savea died at the hospital. The apology ceremony yesterday was organized by Nuuanu Baptist Church, First Chuukese Church, and Micronesians United. Micronesian and Samoan cultures both have a ritual apology, and community leaders used the connection as an opportunity to build harmony and peace. Akendo Onamwar, pastor of the First Chuukese Church in Honolulu, which has about 300 members, said the group wanted to promote healing with all cultural groups, not just Samoans. "A lot of the Micronesians are pretty angry for what happened," he said. "We are not that kind of people. We are not some people that would go out and make trouble all the time." Before the funeral, about a dozen pastors and other Micronesian community members waited outside the Affordable Casket and Moanalua Mortuary. Too Paogofie, pastor of Nuu Loto Samoan Church, stood in the foreground, and although of Samoan descent, he represented the Micronesian community. In Samoan, he asked for permission to intrude. He told them, "We are hurting with you, and we are praying for you." The Samoan group accepted their apologies along with handshakes, lei, donations, and a fine mat called a fala. "It was good they just came for forgiveness," said Chris Leaeno, 17, a cousin of Savea. "That's all we can do now is let the past be the past." Some said it was the first time for the apology ritual to be performed locally between Micronesian and Samoan cultures. Paogofie, a pastor since 1980, said: "In order for us to survive in a strange environment, we need to be in a community. We need to be united and uniting because this is a strange, strange environment. It's a culture shock, especially on our young boys and girls." 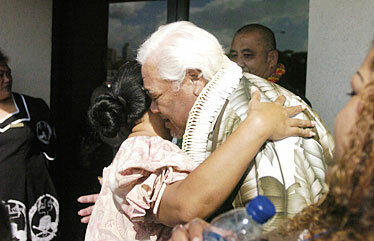 Savea's remains will be taken back to American Samoa today. An only child, he is survived by his mother in American Samoa. Savea graduated last year from Samoana High School in Fagasa, American Samoa, and came to Hawaii for an education and a new future, said his longtime friend Mamamo Tua, 24. "He was a quiet kid. He likes helping out his family. He doesn't hardly go out," Tua said.